Minimum 10 fans. 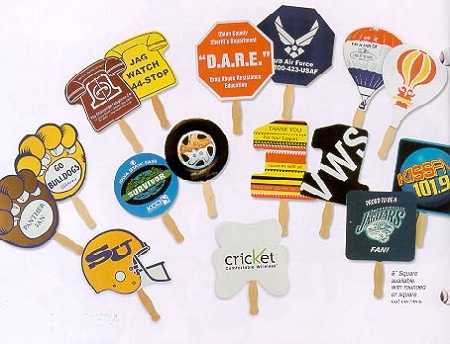 Note quantities of 10 to 124 fans will be printed on a lightweight uncoated stock and all die cuts may not be available. Pricing breaks start at 125 and substantial discounts are at orders of 250+ fans. 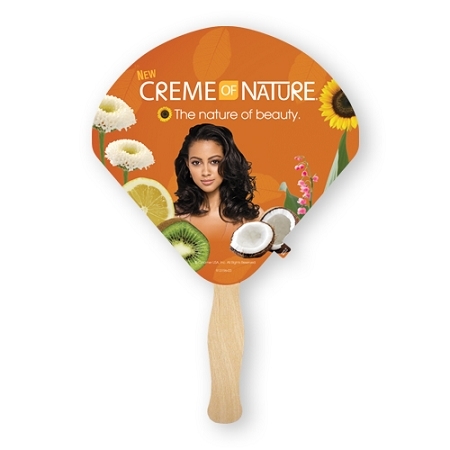 Quantities of 125 or more fans will be printed on 16 point coated board stock, back side can also be coated for an additional charge. Please note that the fans start as white, any color you put on them including black counts as an imprint color. You can imprint the fan and leave the white showing. Additional Colors / back side (with stick) imprint and full color photograph printing also available, see the other items. Imprint for the entire order will be the same. Numbered auction paddles are available. They are priced as a separate item. GALLERY of images you can use. Also many imprint samples are located on our fan page where you can find easy to work with templates. Fans ship printed and assembled. An approx 8" basswood wavy paddle fan stick is attached to the back of each fan. 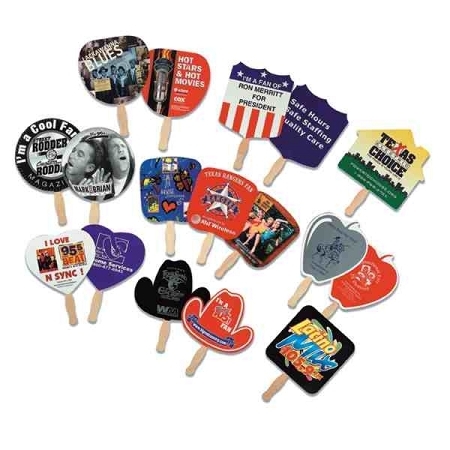 When printing on the back of our single fans allow for an approximate 4½" H x 1-1/4" W space for handle placement.